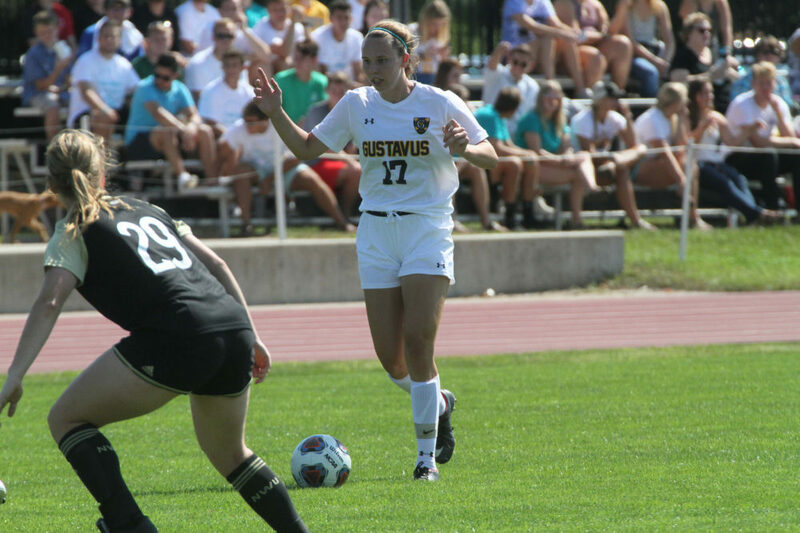 ARDEN HILLS, Minn. – The Gustavus women’s soccer team fell to Bethel on Saturday by a final score of 4-3. The loss puts the Gusties at 4-7-1 overall and 1-4-1 in conference play. The Gusties got off to a quick start in the 3rd minute after Katie Ashpole (So., Chaska, Minn.) received a pass from Chase Miller (Sr., Brooklyn Park, Minn.) and scored her second goal of the season to take an early 1-0 lead. Bethel answered back with two quick goals in the 10th and 15th minute to put the Royals on top before Rachel Rehnelt (Fy., Albert Lea, Minn.) scored for the Gusties in the 19th minute to even the game at two. The game remained tied until the 55th minute when Bethel regained the lead with another goal, but in the 67th minute Lucy Thompson (Jr., Edina, Minn.) scored her first goal of the season to bring to the Gusties back to even. The game looked like it was headed to overtime until the Royals punched in a goal with less than five minutes remaining to take the victory. The Gusties will next be in action on Tuesday when they play host to Saint Mary’s at 4 p.m.